From the smallest Cryptocoryne parva to the large Cryptocoryne crispatula var. 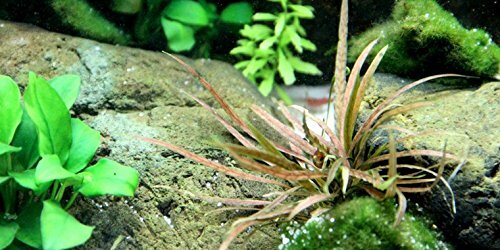 balansae, the wide variety makes Cryptocoryne an excellent choice for different positions in a planted aquarium. 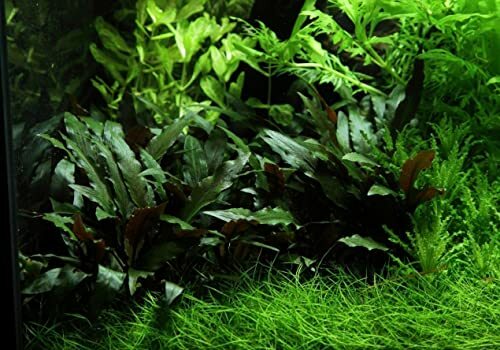 Another factor which makes Cryptocoryne an essential plant in the layout is its outstanding tolerance of shades. With this characteristic, Cryptocoryne can flourish even if it is planted in shades with poor sunlight under stem plants and driftwood. 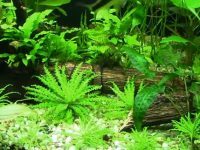 This article introduces some popular Cryptocoryne species that are ideal for making different kinds of layouts. Cryptocoryne wendtii ‘Green’ have submersed leaves that stay green at all times; however, it may also grow a small number of brown leaves among the green leaves. This representative Cryptocoryne species looks really elegant when it grows big. 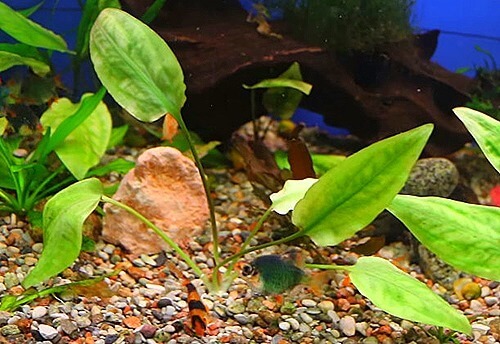 A group of Green Cryptocoryne is a great addition to the midground. 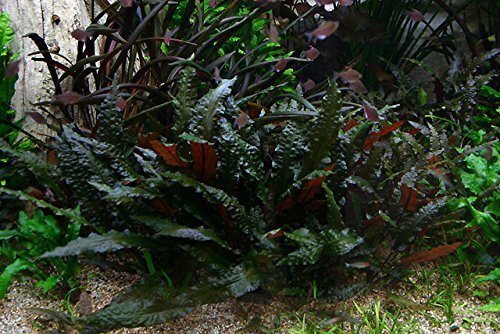 In contrast to the Green Cryptocoryne, Cryptocoryne wendtii ‘Brown’ is a representative species of brown Cryptocoryne that adds warmth to the aquascape. The dark green submersed leaves are beautiful with a reddish brown underside. In certain environments, both topside and underside are brown and the veins turn olive green. The Cryptocoryne wendtii ‘Tropica’ is distinguishable from other Cryptocoryne wendtii species with its broad, brown-color hammered leaves. This species casually placed under driftwood shows the attraction of Cryptocoryne hiding in the shade. This is a new, red variety of Cryptocoryne wendtii with the usage as Cryptocoryne wendtii ‘Tropica’. 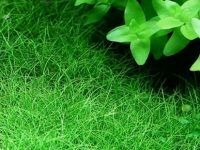 Easy to grow in any water and at a broad range of temperatures. As with all Crypts, lighting and water chemistry should be kept constant if possible and a nutrient-rich substrate should be provided. This will result in fast growth and dense tufts. 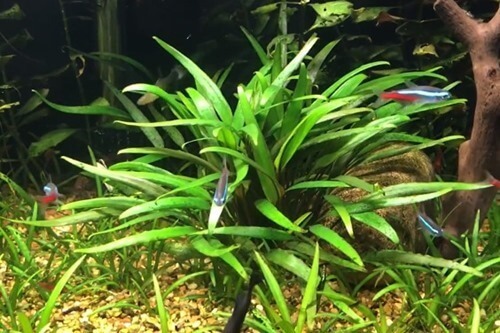 Cryptocoryne wendtii ‘Mi Oya’ grows fast and produces very broad leaves once adapted to the aquarium environment. 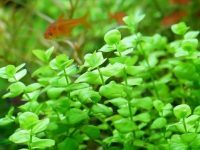 The submersed leaves in aquariums are reddish brown while the emersed leaves are green in color. The broad leaves are slightly hammered, but not obvious as Cryptocoryne wendtii ‘Tropica’. A cluster of this species snuggling against stones in the midground looks very attractive. Cryptocoryne pontederifolia features heart-shaped leaves in a light green color. This plant slowly develops new leaves vigorously from the inner part. A single plant does not develop many leaves. The topside of the leaves is sometimes tinged with red in good lighting condition. It will look attractive if used in the layout as an accent. 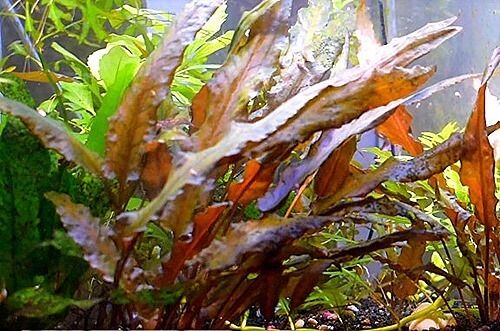 Cryptocoryne undulata grows relatively big and has a high tolerance to environmental changes. This species has two types, red and green. Both of them have red-tinged submersed leaves with undulating edges regardless of the environment in which they are grown. This species should be planted in groups to highlight the fascinating look of its beautiful leaves. 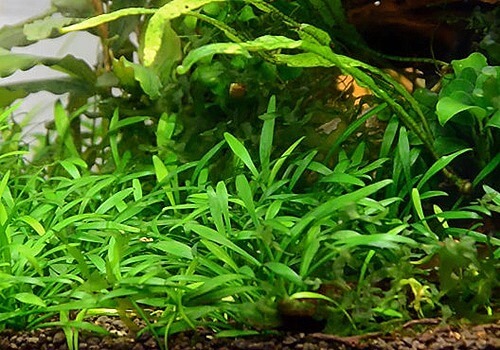 Cryptocoryne parva is the smallest known Cryptocryne and is excellent for using as a foreground plant. The growth rate of this plant is very slow. Early dense planting and careful maintenance are required to achieve a dense carpet look like the picture. 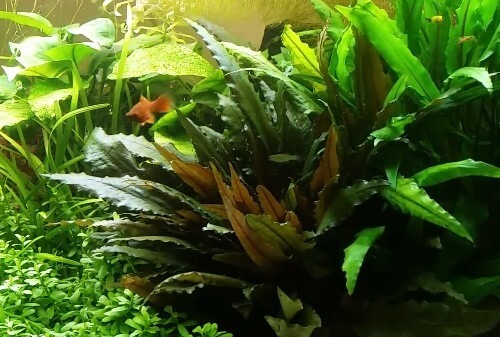 A dense and beautiful carpet of Cryptocoryne parva looks splendid and demonstrates great aquascaping skill. 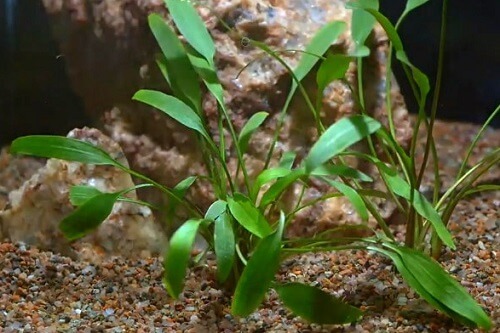 Cryptocoryne lucens originally grows with narrow, upright leaves as shown in the above picture. The beautiful leaves of Cryptocoryne lucens attract everyone who sees it. A single plant of this species in the midground looks very attractive. The submersed leaves of Cryptocoryne willisii have a relatively long stem compared to its closely-related Cryptocoryne parva and lucens. The long leaves bring a distinctive atmosphere to the layout. This plant is suitable to be planted at the side of stones and driftwood to create a natural ambience in the layout. One of the most beautiful plants you can get your hands on! 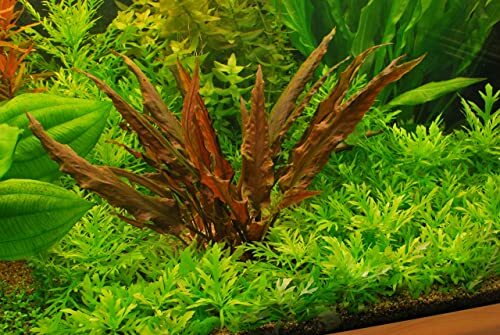 Its tape-like wavy leaves are appealing and best suited for the background location of large planted tanks. The main leaf veins turn wine red color depending on the environment that further enhances the beautiful appearance. 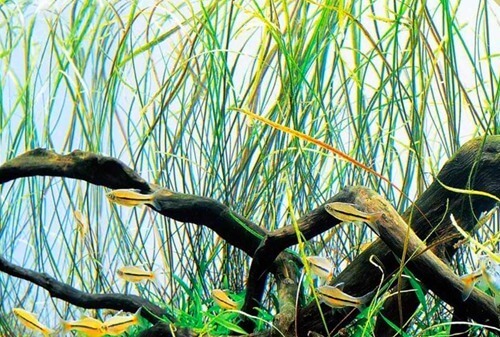 Leaves can grow to considerable length and will float on the water surface in aquariums. 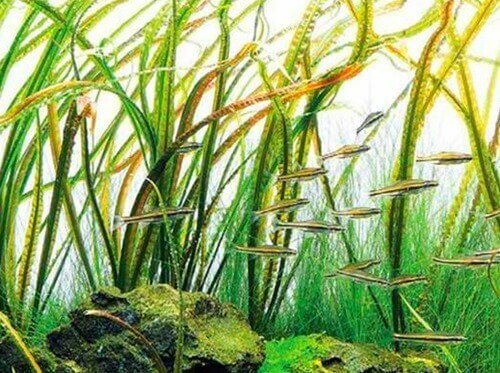 Excessively long leaves should be cut off because the leaves overhanging along the water surface may block the light into the aquarium. This plant closely resembles Cryptocoryne crispatula var. balansae, but its leaves are not as wavy as var. balansae. The leaves are in olive-green color, and unlike the light green leaves of var. balansae, give an austerely elegant impression. Like other tape-like Cryptocoryne species, this plant is mainly used in the background. A soft impression can be achieved by planting it together with Hair grass. This species is easily identifiable with its narrow tape-like leaves. Its leaf color varies ranging from green to brown, sometimes with spots depending on the growing conditions. The volume of each plant is relatively small, so initial dense planting is recommended. It is slow growing and requires adequate light and CO2 supplementation to thrive. Among varied Cryptocoryne species, Cryptocoryne albida is one of the easy-to-use species for layout in terms of size, shape, and toughness. 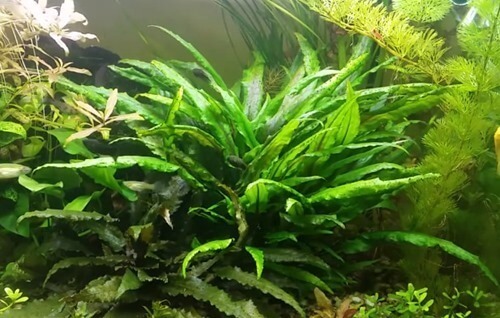 This narrow-leaf Cryptocoryne is suitable to be planted in the midground of the layout. The appearance of the leaves differ depending on the amount of light; they turn green under low light while brown spots appear on the leaves in relatively high light conditions. Some leaves have slightly wavy edges. Cryptocoryne beckettii ‘Petchii’ develops glossy and spotless submersed leaves that are olive green in color, which is an attractive feature of this aquatic plant. 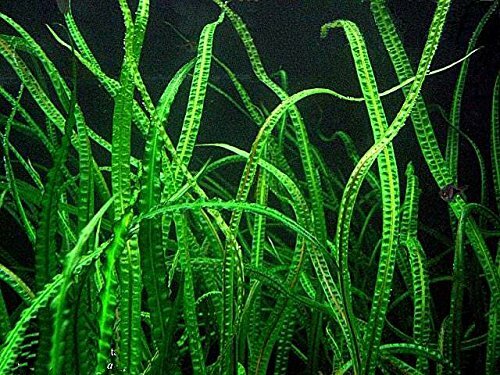 The submersed leaves with slightly wavy edges grow up to about 4-8 inches long. 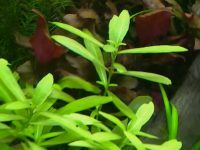 This very strong Cryptocoryne grows well even in relatively hard water and is ideal for beginners. 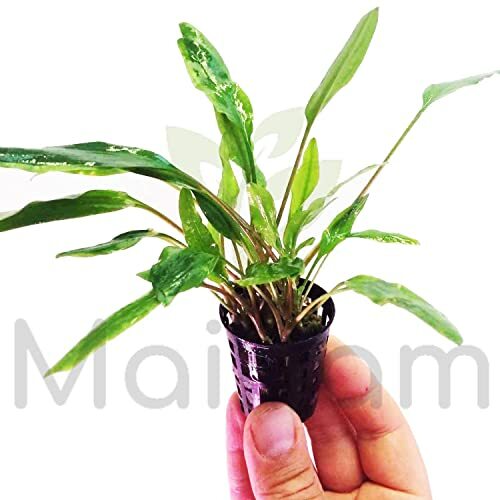 Cryptocoryne walkeri is a strong and easy-to-handle species which is relatively easy to grow. Although resembling Cryptocoryne wendtii ‘Green’, the slightly upright and stiff leaves makes it distinct from C. wendtii. When submerged, its leaves are gradually tinged with red and form wavy edges. The brownish line from the leaf stem to the main vein is beautiful. The growing conditions in the aquarium determine how much the leaves are tinged with red. This species forms very decorative dense clumps in the midground.